US presidential candidate Barack Obama has said he would use military force if necessary against al-Qaeda in Pakistan even without Pakistan's consent. 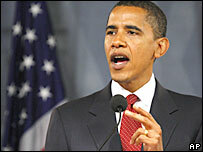 Mr Obama made the comments in a speech outlining his foreign policy positions. Pakistan's foreign ministry said any threat to act against al-Qaeda from within its territory should not be used for political point-scoring. Earlier this month, Mr Obama's chief rival, Hillary Clinton, described him as "naive" on foreign policy. The attack from Mrs Clinton came after a televised debate between Democrat presidential hopefuls. During the debate Mr Obama said he would be willing to meet leaders of states such as Cuba, North Korea and Iran without conditions. In his speech at the Woodrow Wilson International Center for Scholars, in Washington, Mr Obama criticised the Bush administration's focus on al-Qaeda in Iraq, saying US President George W Bush was "confusing" the mission. He said Americans were more vulnerable to terrorist attacks than before the 9/11 attacks because of a war in Iraq "that should never have been authorised and should never have been waged". "The first step must be getting off the wrong battlefield in Iraq, and taking the fight to the terrorists in Afghanistan and Pakistan," he said. Mr Obama said General Pervez Musharraf, Pakistan's president, must do more to end terrorist operations in his country. "It was a terrible mistake to fail to act when we had a chance to take out an al-Qaeda leadership meeting in 2005," he said, referring to reports that the US had decided not to launch a strike for fear of harming ties with Pakistan. "If we have actionable intelligence about high-value terrorist targets and President Musharraf won't act, we will," Mr Obama said. The BBC's Jonathan Beale, in Washington, says such comments are clearly designed to bolster his credentials among a domestic audience. But a spokeswoman for Pakistan's foreign ministry, Tasnim Aslam, told the AFP news agency that talk of military action was a serious matter and political candidates and commentators should "show responsibility". White House spokesman Tony Snow defended Pakistan's leadership, saying it was working hard to fight al-Qaeda and Taleban fighters within its borders. Gen Musharraf has been a key US ally in its so-called "war on terror" since the 11 September 2001 terrorist attacks. But US officials have publicly said recently that they believe Pakistan has let al-Qaeda and Taleban militants reorganise themselves in tribal areas bordering Afghanistan.